Many tenants in Beijing are facing rent increases this summer, forcing them to move to cheaper accommodation further away form the city center and necessitating a longer commute to and from work. One typical example is a rent of CNY5,386 a month in April, rising to CNY6,100 a month in June. As the central government has acted to control housing prices in previous years, real estate agencies have shifted their focus from the selling to leasing business, which appears to be more profitable. In Chinese cities, agencies buy or rent apartments from individuals or landlords. They then restore the apartments in a similar style to build up a brand and to rent to tenants. The agencies profit from the difference in price and also charge management fees to both sides. As these agencies, including Ziroom, YOU+ and MoFang Apartment, have gained billions of dollars in investment and grown rapidly in the past two years, they have expanded their market share by buying a large number of apartments. This helps them to monopolize the market and raise rents. Xia Lei, Deputy Director of the Evergrande Research Institution, co-established by the Evergrande Real Estate Group and Tsinghua University, said capital the agencies have raised has played an important role during the latest round of rent increases. “The investors urgently want to start making money which will inevitably lead to soaring rents,” Xia said. “Rapid rent growth will affect people’s living quality and willingness to consume, which will damage a city’s competitiveness and attraction.” Xia said the government should intervene in the rental market and regulate the industry. The Beijing Municipal Commission of Housing and Urban-Rural Development instructed agencies in August not to use bank loans to buy apartments or to pay higher than market prices to acquire apartments to rent out. 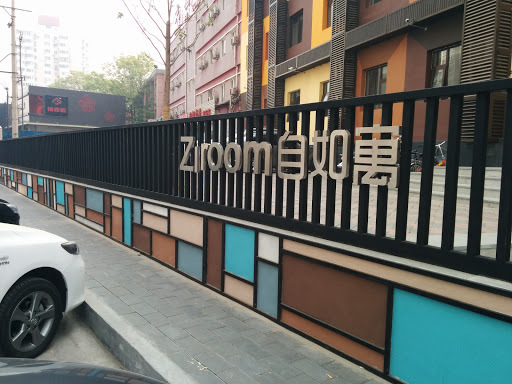 Ziroom promised to provide 80,000 apartments from its stock to the market. According to the agencies, the major reason for the rent rises is a supply shortage. The demolition of illegal buildings and a prohibition on co-renting to prevent safety risks has led to a reduction in supply. In the past year, Beijing has torn down 59.85 million square meters of illegal construction and plans to demolish another 40 million sq m this year. On the other hand, the city’s overall salable area of apartments in the past year was 8.75 million sq m and its affordable housing area was 2.67 million sq m. Beijing’s total floor space for residential buildings is 882 million sq m. According to RealData, the average rent in Beijing in the first seven months of this year grew by 10.7% year-on-year. According to China Economic Weekly, up to 13 first- and second-tier cities in China saw rent increases of more than 20% in the past year. Chengdu, capital of Sichuan province, ranked top with a rise of 30.98% on average, followed by Shenzhen in Guangdong province with rent growth of 29.68%. Rent increases in Beijing and Guangzhou, capital of Guangdong, also surpassed 20% year-on-year this month, the China Daily reports. China Evergrande, China’s third largest property developer by sales, posted a 101.5% surge in first-half core profit to CNY55.01 billion, while revenue rose 59.8% to CNY300.35 billion on the same period last year. Contracted sales in the first six months of the year increased by 24.6% year-on-year to CNY304.18 billion, accounting for more than half the company’s annual sales target. Evergrande CEO Xia Haijun expects that over the next three to five years, the country’s top 10 developers will account for 40% of the whole market while the top three – Country Garden, Vanke and Evergrande – will account for around a fifth of all sales. Of the 12 of Hong Kong-listed Chinese developers that have released half-year results, only one missed estimates. Foreign buyers are increasingly investing in Chinese commercial property, as Chinese competitors are now hampered by Beijing’s financial deleveraging campaigns. “Overseas investors have always been interested in commercial property in China, especially those in its tier 1 cities. The difference now is that domestic investors are grappling with financing difficulties and rising funding costs, which has given prominence to overseas investors’ activities,” said Xu Xixi, Director of JLL’s Capital Market for North China. “There are definitely opportunities for cashed-up investors with access to inexpensive capital to take advantage of the current deleveraging taking place throughout China,” said Anthony McQuade, Managing Director of Savills Northern China. Brookfield Asset Management just closed an investment in two shopping malls in Shanghai for an undisclosed price, after announcing earlier this year it would invest CNY2 billion in China in the next five years. In a deal announced on July 9, the property investment arm of Germany’s Allianz bought an office tower in Beijing from Kailong Group and Goldman Sachs valued at USD185-196 million. The company said it expected China to account for 50% of its Asia-Pacific fund allocation going forward from 40% now, with a focus on the new economy and logistics sectors. US private equity firm Blackstone has raised USD7.1 billion to invest in real estate across Asia, in its largest ever fundraising activity. UK-based AEW Capital Management also announced it had raised USD1.12 billion for an Asia-Pacific property fund that viewed China as a target market. The Singapore sovereign fund GIC and the Canada Pension Plan Investment Board have, respectively, recently launched funds with local developers to acquire rental apartment projects. Savills North China’s McQuade said international investors have been historically underweight in Asia and China, and were now looking for chances to add to their portfolios to better reflect the global weight of economies and property markets, the South China Morning Post reports. Meanwhile, Shanghai has canceled five planned land sales worth a total of CNY10 billion in 20 days, reflecting the dampened appetite of developers. 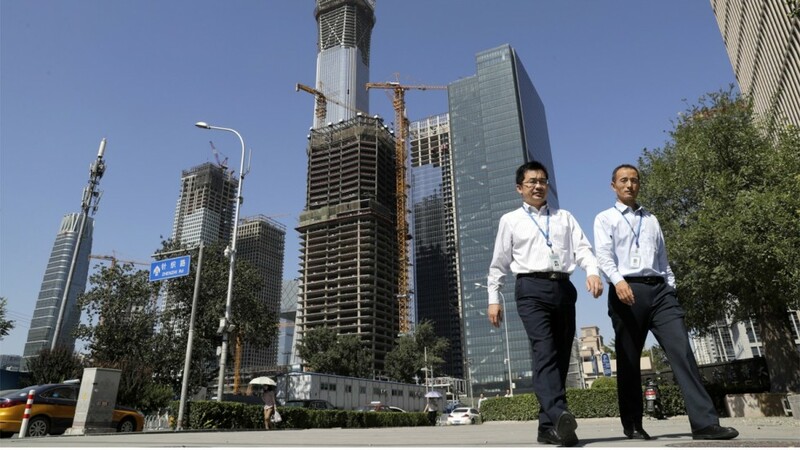 Chinese developers are facing a liquidity squeeze and rising funding costs as a result of the government’s deleveraging campaign and efforts to rein in housing prices. According to the Shanghai Bureau of Statistics, citywide property investments in the first half grew 3.6%, while new home starts slumped 6.4%. Property sales rose 3%. In Shenzhen, 26 parcels of land were sold in the first half, fetching CNY10.9 billion, down 67% from the same period last year. China is opening up more to foreign financial institutions as regulators are accepting applications to increase the foreign share in financial services joint ventures beyond 50%. 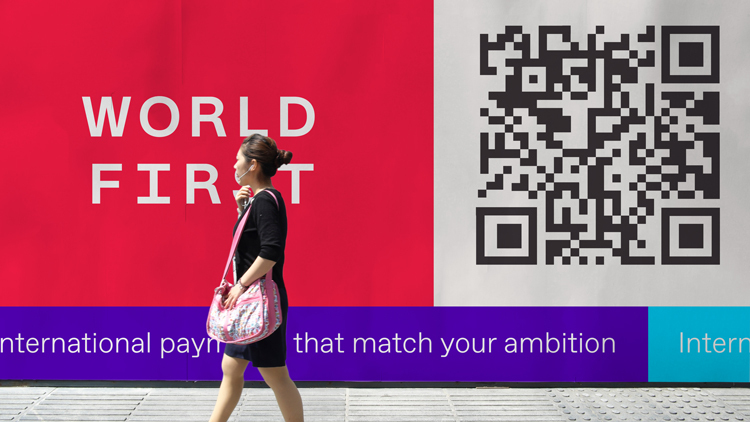 The People’s Bank of China (PBOC) received an application from London-based payment service provider WorldFirst to operate in China in a segment that both Visa and Mastercard failed to crack in the last decade. The China Securities Regulatory Commission (CSRC) may soon allow UBS to take raise its stake in UBS Securities from 24% to 51%, while Dublin-based Experian could be granted a license to collect and provide corporate credit information in China – a license that even Chinese firms find hard to get from the PBOC. Some analysts said relaxation of the rules amounted to little more than window dressing to ease the pressure from Washington over China’s trade surplus with the U.S. and other disputes, and that it was difficult for foreign firms to profit in the country. “I’m skeptical that there will be major entry by foreign companies into China’s financial institutions,” said Andrew Collier, Managing Director of Orient Capital Research in Hong Kong. “There’s no way that China will allow foreign companies to have a big market share in key parts of the system, which include financial transactions, saving deposits and payments in general,” he said. “The core commercial banks will remain tightly controlled by the Chinese, or the Chinese companies, and the foreign participants will be nipping around the edge of the financial system.” More than 15 years after China entered the World Trade Organization (WTO) in 2001, foreign institutions still have a limited presence in the financial market and in most cases rely on local partners. But according to the Chinese authorities, there has been an enthusiastic response to the latest promises to open up. A number of commercial banks from the United Kingdom, Japan and Singapore, and a few French and German insurers, have said they want to build or boost their presence in China, the China Banking and Insurance Regulatory Commission (CBIRC) said last month. In the middle of last year, Beijing allowed foreign credit rating agencies to enter its domestic market, and some restrictions on foreign ownership of Chinese financial companies and their business operations were relaxed after U.S. President Donald Trump visited Beijing in November. Last month, People’s Bank of China Governor Yi Gang announced that foreign ownership caps on lenders had been removed, and foreign investors could now take an equity stake of up to 51% in brokerage, futures and fund management firms, the South China Morning Post reports. Chinese companies are selling off U.S. properties like the Waldorf Astoria. 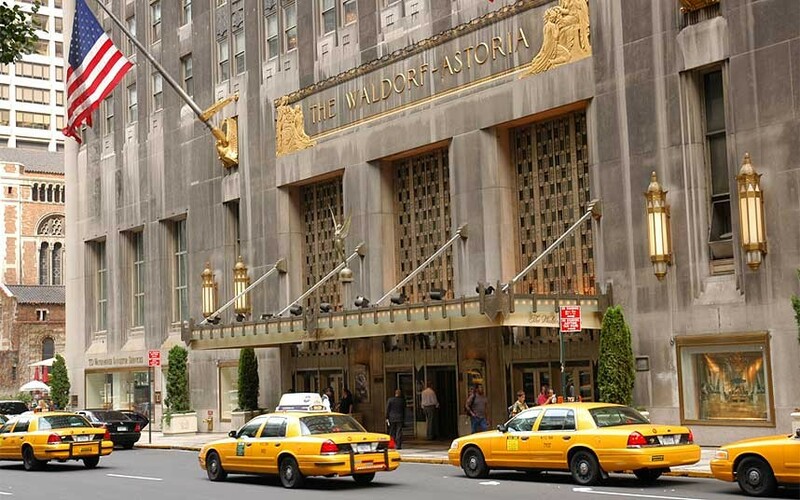 When Wu Xiaohui, Anbang Insurance Group’s billionaire founder, bought Manhattan’s landmark Waldorf Astoria in 2015, he said he planned to hold onto the hotel for 100 years. Only two years later, however, he was arrested. Anbang was officially taken over by the Chinese government in February, and Wu pleaded guilty in March to fraud and embezzlement, facing a potential life sentence. The company’s U.S. assets – including the famous hotel – are back on the block. Anbang is among a list of Chinese conglomerates that went from buying up billions of dollars of hotel and office buildings in the U.S. to collectively selling them off in just a couple of years. From HNA Group to Dalian Wanda Group, Beijing’s tighter grip on capital outflows has brought down once high-flying deal makers and prompted Chinese companies to reverse course and to sell their recently-acquired overseas assets. “Few could have predicted Chinese buyers’ fast entry” a few years ago, said Richard Hightower, Real Estate Analyst at the New York-based investment bank Evercore ISI. “And few could have predicted their quick exit either.” At the height of the buying spree, Chinese companies invested a total of USD37 billion in U.S. real estate from 2014 to 2016, according to Real Capital Analytics, a New York-based commercial property data provider. Many of the assets are now in the market to be sold as the Chinese government reins in the risks imposed on the companies as well as the financial system as a whole from the debt-fueled acquisitions. The sharp reversal has sparked hopes among U.S. investors, including the Blackstone Group, that a potential fire sale of these assets could create buying opportunities. But while talks are continuing about buying back San Francisco’s Westin St. Francis in San Francisco and JW Marriott Essex House in New York – two hotels Blackstone sold to Anbang through Strategic Hotels & Resorts in 2016 – Waldorf Astoria is a much harder deal. The hotel, part of which is being converted into condominiums, is hard to value because it is no longer entirely a hotel, analysts said. That, combined with financial factors like the lack of cash flow during the renovation, makes it a difficult property to assess for real estate buyers specializing in hotels. Wall Street investors acknowledge that despite the pressure on Chinese companies to sell, many have managed to turn a profit. HNA’s unloading of its stake in Hilton Group is expected to generate USD2 billion in profit, the South China Morning Post reports. HNA Group has sold USD13 billion of assets in recent months and is continuing to sell more. Carmaker BMW believes chic but tiny dwellings could represent the future of city living and is rolling out an ambitious urbanism and architecture project, Mini Living, in Shanghai. As part of the project, the company is transforming an abandoned paint factory into housing. BMW revealed its first concept apartment at the 2016 Salone de Mobile – Milan’s annual furniture exhibition – but now the Mini Living team and Chinese developer Nova Property Investment are making the design a reality. The companies have not yet revealed a timeline or pricing for the development. Developers will combine six buildings, which will each include two to 10 residential units. Construction will begin this month. Residents will be able to partake in cultural events, rooftop farming, and a car-sharing program. The building will also feature plenty of communal spaces for working, eating, and hanging out. Each apartment will be no larger than a few hundred square feet, though BMW predicts that residents will not spend much time in the small spaces. The building will include shops, restaurants, a roof terrace, gardens, exhibition areas, and a food market. There will be two different apartment options. One-bedroom units will have access to a shared kitchen and communal areas, while those with two-bedrooms will have private kitchens. The design builds on Mini Living’s concept apartment, which was unveiled last year. The company believes that micro-apartments could represent the future of city living, as urban metropolises become even more dense. “Let’s take a look at one of the most pressing challenges we are facing today in our highly dense urban environment. 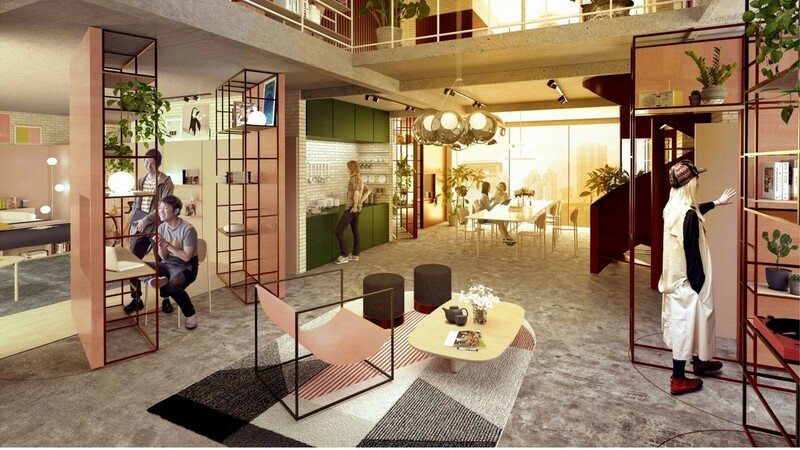 It becomes obvious that, on the one hand, it’s the sheer scarcity of space and, on the other hand, how we use the space we have available,” Oke Hauser, creative lead at Mini Living, said, as reported by the South China Morning Post.